Fish Tacos $18.95 Three Tilapia Tacos Smothered With Our Own Sauce. Served With Rice, Beans Sour Cream, Guacamole and Pico de Gallo. Shrimp Chimichanga $18.95 Two Chimichangas Stuffed With Shrimp & Fresh Vegetables With Sour Cream & Guacamole. Served With Rice & Beans. Arroz Con Camarones $18.45 Sautéed Shrimp, Onions, Green Peppers And Mushrooms. Served On A Bed Of Rice Topped With Melted Jack Cheese. Choice Of Flour Or Corn Tortillas. 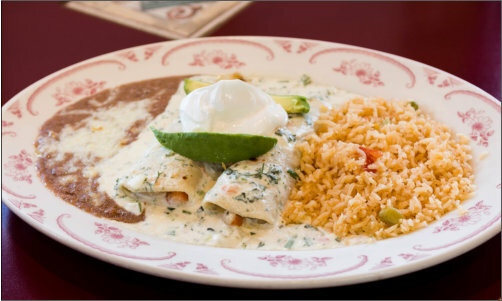 Crab Enchilada $18.95 A Crab Filled Enchilada Topped With Green Sauce & Monterrey Jack Cheese. Served With Sour Cream. Guacamole Or Avocado Slices Camarones A La Diabla $18.95 Shrimp & Mushrooms And Chile. Served As Hot As You Like. *mild, **med, ***hot (A La Diabla.) Served With Rice & Beans. Camarones Blanco $18.95 Shrimp Simmered With Onions, Bell Peppers & Mushrooms, And Vegetables Then Covered In A Delicious White Cream Sauce. Served With Rice, Beans & Tortillas. Grandpa Davids Saute´ $19.95 Scallops, Shrimp, Crab Meat And Chicken With Mushrooms, Zucchini & Carrots In A Creamy White Sauce. Served With Rice And Beans. Shrimp Tacos $18.95 Shrimp Folded Into Soft Tortilla With Pico De Gallo, Served With Rice, Beans, Sour Cream And Guacamole. 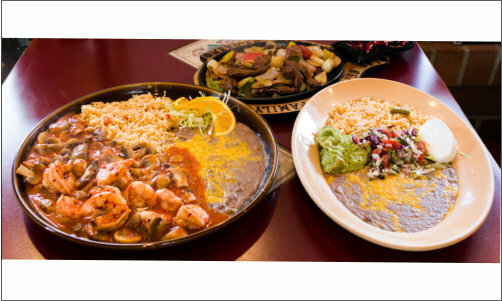 Shrimp Fajitas $18.95 A Traditional Mexican Dish With Sautéed Shrimp Green Peppers & Onions. Served With Rice, Beans Sour Cream, Guacamole & Tortillas. Seafood Chimichanga $18.95 Two Chimichangas Stuffed With Crab, Scallops And Shrimp. Topped With Espuelas Salsa Blanca And Sliced Avocados. Served With Rice & Beans. 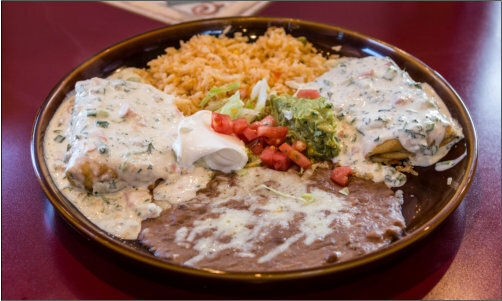 Deluxe Shrimp Enchilada Special $18.95 Corn Tortilla Filled With Shrimp, Mushrooms, Green Peppers And Onions. Topped With Green Sauce & Monterrey Jack Cheese Sour Cream & Avocado Slices. Served With Rice & Beans. Camarones Chipotle $18.95 Shrimp With Onions, Bell Peppers & Mushrooms Simmered With Vegetables Then Covered In Our Chipotle Sauce. Served With Rice, Beans & Tortillas. Seafood Enchilada $18.95 Two Enchiladas Stuffed With Crab, Scallops & Shrimp. Topped With Espuelas Salsa Blanca & Sliced Avocados. Served With Rice And Beans. Camarones Appaloosa $18.95 Shrimp Wrapped In Bacon With Peppers & Onions Topped With Melted Cheese. Served With Rice & Beans & Pico de Gallo. Camarones Mojo De Ajo $18.95 Shrimp Sautéed In Butter, Garlic & Mushrooms. Served With Rice & Beans Or Salad.